Give a friendly minion Charge. It can't attack heroes this turn. This article is about the card. For the ability see Charge (ability). Charge is a warrior spell card, from the Basic set. Two copies of Charge are automatically included in all players' collections upon unlocking the warrior class. Two Golden copies of Charge are a reward for raising a warrior to levels 23 and 26. Charge is uncraftable and cannot be crafted or disenchanted. This card grants a single enchantment with two separate effects: providing Charge, and preventing the minion from targeting the enemy hero on its first turn. The regular Charge ability imparts no restrictions on attack targets without this secondary effect. The entire enchantment is permanent and remains after the first turn in play. Example: If the affected minion is copied by Faceless Manipulator on a later turn, the full enchantment is copied, allowing the copy to attack minions (but not heroes) on its first turn in play. Even if the minion this card is used on already has Charge, the secondary effect will still prevent it from attacking the enemy hero that turn. Forgetful minions buffed with this spell can still potentially attack the enemy hero if their effect triggers and switches their target to the hero. Despite acting functionally similar to Rush, cases where this card is different from it is that minions summoned from earlier turns will not be able to attack heroes and with Charge synergy effects (i.e. Warsong Commander). This card is useful for getting a powerful minion into combat, but cannot be used for face damage. Mostly useful for trading or making use of specific effects, such as Deathrattles or damage-triggered effects. As a low-impact card that requires other cards to be useful, this card is generally too weak to hard include in a deck. If all minions in the deck are Mechs, Skaterbot provides the same effect and +1/+1 for the same cost. Rocket Boots provides the same effect plus card draw, for an extra mana. Charge saw various incarnations over the course of the game's alpha and beta. Its earliest known form had the text "Give your minions Charge this turn." and cost 0 mana. This version saw many players using it as a one turn kill combo on later turns: they would play several high-Attack minions from the hand, followed by a 0-mana Charge, allowing for huge amounts of face damage in a single turn. In this respect it was similar to the version of Unleash the Hounds in play at that time (1 mana, "Give your Beasts +1 Attack and Charge. "), which was changed around a month before Charge. 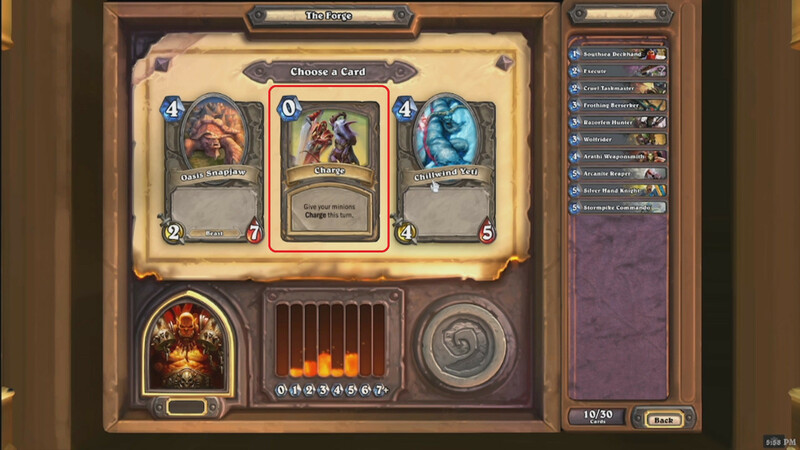 This version of the card not only proved highly frustrating for opponents but ran contrary to the developers' intentions for interactive gameplay, and was changed shortly before the game's full release to read "Give a friendly minion +2 Attack and Charge", and its cost increased to 3. Despite its potential for finisher combos, this new version saw very little play in most game modes, save for one-turn kill combos such as the infamous "OTK Worgen" deck. In October 2016 the card was changed again, reducing its cost to 1 and giving it the new text "Give a friendly minion Charge. It can't attack heroes this turn." This change finally provided a solution to the developers' concerns around the card's ability to grant Charge, and was one of the last stages of their previously announced plan to reduce the presence of effects that granted Charge, as seen with the earlier nerf to Warsong Commander (previously granting Charge to any friendly minion with 3 or less Attack). The new version's restrictions prevented it from being used for finishing combos, thus opening design space for future cards, while still retaining the card's core design. While relevant to numerous subsequent releases, Mean Streets of Gadgetzan's Grimy Goons theme of buffing cards in the player's hand was later cited by Ben Brode as a reason for changing Charge. "A charge is one of those things that always ends badly for someone." Charge is an early ability learned by warriors in World of Warcraft. It allows the warrior to quickly dash to their target and root it while also gaining Rage to fuel further attacks. Charge was removed for selection in Arena on September 15, 2016 but was reinstated on December 9, 2018. The artwork for this card comes from the World of Warcraft Trading Card Game "Heroes of Azeroth" series, depicting the spell Charge. This spell's effect is nearly identical to the Rush keyword, which was introduced on certain cards in The Witchwood. The only difference is synergy with Charge-related cards like Warsong Commander. Despite the new keyword, as there are few cards with Rush and this spell is part of the Basic Set, the text is unlikely to change soon. Patch 6.1.3.14830 (2016-10-03): Cost reduced from 3 to 1. Text changed from "Give a friendly minion +2 Attack and Charge." to "Give a friendly minion Charge. It can't attack heroes this turn." Commentary: While we enjoy seeing players explore combo styles of play and will continue to support it in the future, we’ve seen in the past that the ability to give Charge to minions that don’t normally have it has been particularly problematic and also heavily restricts future cards. We’ve redesigned the card Charge in a way that provides opportunities for minion combat, but does not enable strategies that intend to win without allowing opponents to interact. Patch 1.0.0.4458 (2014-1-16): Has been reworked and now costs 3 mana. The card’s new power reads: Give a friendly minion +2 Attack and Charge. Patch 1.0.0.3140 (April or May 2013): Text changed from "Give your minions Charge this turn" to "Give a friendly minion Charge". ↑ Hearthpwn - Ben Brode on Defining Complexity, Depth, and 'Design Space'. (2017-01-28). ↑ Dean Ayala (2016-09-08). Hearthside Chat: Upcoming Arena Changes with Dean Ayala. Retrieved on 2019-03-26. ↑ Blizzard Entertainment (2018-12-19). Arena Updates – December 19 2018. Retrieved on 2019-03-26. ↑ Hearthstone: Heroes of Warcraft - Building the Fire (UK). (2013-03-19).